A New Perfume, the latest from Comme des Garçons, is a welcome thing: I miss Comme des Garçons. They haven’t done anything under their own brand since 2010′s Wonderwood, and they haven’t done anything that I loved since their 2009 collaborative effort with Monocle, Monocle Scent Two: Laurel. That was a quick summary I wrote when I reviewed A New Perfume [real name: Comme des Garçons Eau de Parfum] early this year, and since I didn't love A New Perfume, or whatever you want to call it, it still stands. They've done four fragrances since then: a trio for their Play diffusion line, and the new Amazingreen for the regular line. In keeping with my penchant for giving away the ending, I didn't wholeheartedly adore any of this set either, but I liked all of them better than the New Perfume thing. Comme des Garçons' Play line launched in 2002, and features t-shirts, cardigans and other casual basics / accessories; most of the clothing would look like it came from the Gap but for the addition of the Play logo — the red heart with eyes that they also used on the first Play fragrance (2007). That fragrance had a likewise "casual basic" feel, which carries over into the new trio — Red Play, Black Play and Green Play, all developed by perfumer Antoine Maisondieu. Red Play is arguably the most fun of the trio. It opens on peppered red fruits, more tart than sweet, with a brief flash of cherry cough syrup. What starts as a slight almondy undertone gets sweeter (but never too sweet) and closer to marzipan as it dries down, and is joined by an overdose of dusty cinnamon; with the fruits and the sheer flowers and the pale woody base, it has the air of a lively but grown-up almost-gourmand. Hours after application, it smells like a dry cinnamon biscuit, the sort of thing you might dip in your coffee. It's lightweight enough to wear in any season, and it has reasonably good staying power. The more I wore it, the more I liked it, still, I never fell completely in love — I'd certainly wear it if I had a bottle, but so far, it's not going on the buy list. Then again, we'll see what happens when I sort my samples — this one might end up in the purgatory basket for another try in the future. (The notes: red mandarin, pink pepper, safraleine, red cherry accord, geranium, cinnamon, osmanthus, myrrh and balsam of Tolu). Verdict: I was not at all impressed with this trio the first time I tried it, but later wearings have changed my mind. They're quite well done, and any of the three is a better fragrance — and a better fit with the brand — than the original Play fragrance. Very worth a try, even if none of them swayed me in the end. 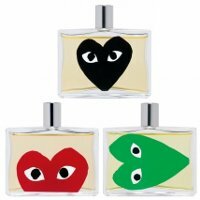 Comme des Garçons Red Play, Black Play and Green Play are available in 100 ml Eau de Toilette, $100 each. Two green fragrances in one year from the same brand seems an embarrassment of riches, and a green with gunpowder notes? In the lovely Comme des Garçons signature pebble bottle? Sign me up. As it turns out, Amazingreen, while quite green, is not to green as Wonderwood was to wood, that is, it is green, but not GREEN! GREEN! GREEN! Since I didn't love Wonderwood anyway, I ought not to complain, but of course, complain I will. Amazingreen starts off, well, green, but also watery-fresh — that "dew mist" listed in the notes is rather pronounced, and it gives Amazingreen the same "fresh" feel as any one of the bazillionty men's fragrances now on sale at Macy's (also listed: palm tree leaves, green pepper, jungle leaves, ivy leaves, orris, coriander, silex, gunpowder accord, vetiver, smoke and white musk). It comes closer to the bitter "stems and crushed leaves" sort of green I hoped for as it dries down, but the gunpowder accord and smoke is subtle at best, and there really isn't anything else here to set Amazingreen apart from any other "green" on the mainstream market — it just smells like your basic sort of green, unisex verging on masculine, mostly clean, mostly fresh. Good alternative to traditional galbanum/citrus greens, but more 'perfectly acceptable' than 'amazing'. 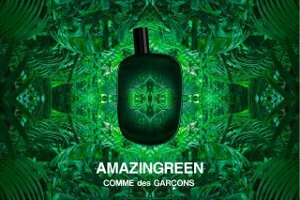 Comme des Garçons Amazingreen was developed by perfumer Jean-Christophe Herault. It is available in 50 ($95) and 100 ($125) ml Eau de Toilette. For buying information, see the listing for Comme des Garçons under Perfume Houses. Nice mini reviews Robin! I didn’t try any of them (and I could as they’re available in Poland in one shop in Warsaw). Based on your reviews and reviews of few other perfume bloggers I would say I might like Play Red, but not for sure. The others don’t catch my attention. I’m having much more interesting sample to try on the way to my house. I have a soft spot for CdG — I’ll try anything they make. I don’t have the spot. I barely know the brand. I really liked Black but had the same problem—it reminded me of other, similar things I’ve liked and made me want to re-try those instead. It’s too bad. Maybe it’s a good entry-level incense? Which is maybe what the whole Play series is sort of about. Robin, I had the exact same response to Red. I really like it, but not quite enough to purchase a full bottle. If I had one, though, I’d wear it. I’m not ordinarily a lover of intense fruitiness or overly strong cinnamon, but somehow these things balance each other in this fragrance, and I find it addictive, especially during the far drydown. Yes…addictive. I kept smelling it, and then thinking about it later when I wasn’t wearing it. So if I’m still thinking about it in a couple weeks, maybe it will go on my list. Funny, because really the first time I wore it, I dismissed it right away as meh. I too have a soft spot for CdG. They are missing an opportunity if they don’t issue a coffret of the three Play bottles. Fifteen mls would be perfect but I’ll accept 30 each That makes more sense to me – I don’t need 100 mls of ANYTHING at this point, even if I love it. Have you tried layering the Play scents, R? Do you think any of them would be good layered? Thanks for the reviews! Little 30 ml bottles like what they did for Sherbet series would have worked for me, and I’d certainly buy Red then (and actually, that design would look great on an opaque white bottle). I didn’t layer them, but if I owned Sherbet: cinnamon, would have tried layering that over Red. I don’t think Green would “help” Red or Black, but who knows, maybe Red + Black would work. I really like the Amazing Green. The bottle is so cool but I find that I really like the smell of it as well. So glad it is finding fans! I also seem to have a soft spot for CdG. It is by far the best represented brand in my whole collection. But, I have to admit, none of them are ever in heavy rotation. I seem to have to be in a very particular mood to want to actually wear Avignon, or Daphne, or even 2. These may be more easy going, but easy-going is not really what I think of when I think CdG! By ‘these’ I meant the play series. I know what you mean, although some of the ones I own (Calamus, and Ouarzazate) or WISH I owned (Steven Jones!, Kyoto) I think of as “easy-going” quirky. Hinoki & Avignon & CdG2, yes, take more thought, and Daphne is beyond my capabilities! As for Stephen Jones: definitely not an every day-er for me but good for when I need to keep my cool and am hoping (against hope) to look sophisticated! and clearly…I like having multiple masks at hand! As do I, and all of us, I guess! I like this line too. These don’t tempt me too much. There are a few others by CdG I want to try first. These certainly aren’t at the top of my CdG list — makes sense to start w/ the best if you can. Anyone else think Amazingreen is very similar to Gucci Pour Homme II? I sampled the CdG fragrance yesterday and was struck by the similarity! Hope someone else will chime in — I hardly remember GpH2.